This is based on the Clive Barker book Cabal and he also wrote the screenplay and directed the film. 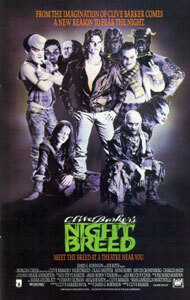 It's about a bizarre collection of monsters known as the Nightbreed who live under a cemetery. Central character Boone starts dreaming about them and ends up in a mental institution where his psychiatrist Dr Decker is played by the extremely creepy David Cronenberg. There is also something nastier than the monsters out there, a sick serial killer who murders whole families. The various threads collide and make for an explosive finale. This is imaginative stuff as you'd expect from Barker and it has some very dark moments but the film drags a little in places and the magical world he has created doesn't entirely hang together. It is very original though and there's a satisfying, if obvious, subtext about how people are the real monsters.